Extensions let you add unique features to dashboards or directly integrate them with applications outside Tableau. Adding extensions is easy; you incorporate them into dashboard layouts just like other dashboard objects. Extensions expand dashboard functionality with the help of web applications created by third-party developers. If you're a developer and want to create your own extensions, see the Tableau Extensions API documentation on GitHub. Note: Tableau administrators can turn off dashboard extensions for Tableau Desktop, Tableau Server, and Tableau Online. The animation below shows an example extension. With other extensions, you'll see different options. Click the image to replay the animation. To add an extension, you first need to download the related .trex file, which specifies the extension's properties, including the URL for the web-based application. In a Tableau workbook, open a dashboard sheet. From the Objects section, drag Extension to the dashboard. Click My Extensions, and navigate to a .trex file you previously downloaded. Click Extension Gallery, and download a new extension. Then click My Extensions, and navigate to the downloaded .trex file. If prompted, allow or deny the dashboard extension access to data in the workbook. For more information, see Data security and dashboard extensions. If you allow access, follow any on screen instructions for configuring the extension. Note: Extension objects will appear blank in prints, PDFs, and images of dashboards (including images in subscription emails). 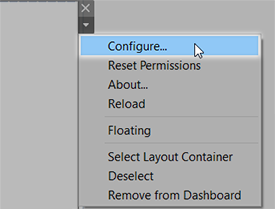 Some dashboard extensions provide configuration options that let you customize features. Select the extension in the dashboard, and from the drop-down menu in the upper-right corner, choose Configure. Follow the on-screen instructions to configure the extension. If a dashboard extension becomes unresponsive, you might need to reload it, which is similar to refreshing a web page in a browser. Select the extension in the dashboard, and from the drop-down menu in the upper-right corner, choose Reload. The dashboard extension is refreshed and set to its original state. If reloading the extension fails to return it to a useable state, try removing it from the dashboard and adding it again. You can add extensions to workbooks you publish from Tableau Desktop or directly in the web-authoring mode of Tableau Online and Tableau Server. A Tableau administrator must allow extensions to run on a site and add extensions that access full underlying data to a safe list. Administrators should only allow extensions that you have tested and trust. If you want to use a dashboard extension on Tableau Online or Tableau Server, direct your administrator to Manage Dashboard Extensions in Tableau Online or Manage Dashboard Extensions in Tableau Server. Dashboard extensions are web applications, which can be running on web servers located outside of your local network. Before adding an extension or viewing a dashboard with one, be certain that you trust the website that hosts it. By default, dashboard extensions use the HTTPS protocol, which guarantees an encrypted channel for sending and receiving data, and ensures some privacy and security. Depending on how an extension is designed, it can access either visible data in a view, or full underlying data, table and field names from data sources, and information about data source connections. When you add an extension, or view a dashboard with one, you're given an opportunity to allow or deny the extension to run and access this data. If you're viewing a dashboard with an extension that requires full data access, and that access has been denied, a message appears in place of the extension. If you trust the extension and want to use it, you can reset permissions and allow the extension to run. Select the extension in the dashboard, and from the drop-down menu in the upper-right corner, choose Reset Permissions. Click either Allow to let the extension run and access data, or Deny to prevent the extension from running. To get help for an extension, you'll need to contact the developer or company who created it. Select the extension in the dashboard, and from the drop-down menu in the upper-right corner, choose About. Click Get Support to go to the support page of the extension developer. 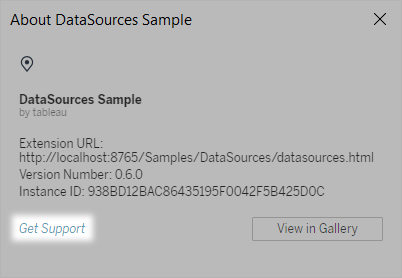 Tableau doesn't provide support for extensions or for other programs that interface with the Extensions API. However, you can submit questions and ask for help in the Tableau developer community.